This season’s cover dress! 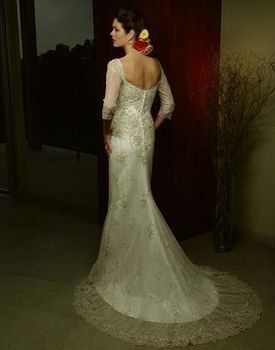 Sophisticated square neckline defines lovely sheer 3/4 lace sleeves. More traditional elements are the mermaid cut skirt along with semi-chapel train. Romantic scalloped hem lace and delicate floral lace throughout the dress make this a timeless creation.